Marth needs to be unlocked. The Prince from the land of Altea from the Fire Emblem series makes a return in the Super Smash Bros series. "Konkai wa boku no kachi da ne?" — "This time it's my victory, isn't it?" "Kyou mo ikinobiru koto ga dekita" — "Today I have survived." "Boku wa makeru wake-ni wa ikanainda!" — "There's no way I can lose!" Marth struggles against projectile users, with no projectile of his own and no reflector, all he can do is dodge and block while closing the distance between the him and the projectile user, which is exactly what the projectile user wants. However, at close-range, Marth is nearly unstoppable. The secret to using Marth is in the spacing between you and your opponent. Marth deals the most damage when he hits with the tip of his sword, so making sure that the correct distance between you and your opponent is essential. Thankfully, his moves cover a lot of horizontal range for a melee weapon. Use the dancing blade to land quick hits on the opponent, quickly building up damage or you can cancel after two or three slashes then go into a smash attack or a shield breaker. This will leave the opponent guessing - is hegoing to do all four slashes, or is he going to cancel early and smash attack me? Trying to fight while figuring all this out will be difficult for him/her, use this to your advantage. Counter can also be used to help block projectile attacks and counter-attack a strong opponent. If the opponent gets a spicy curry dish, use counter when he's up close to block a fireball while attacking. Otherwise Marth would just keep flinching from the fireballs. Double Slash Slashes two times. + + + + Long Slash Slashes outwards. + + + + Arch Slash Slashes in an arch above him. + + + + Blade Poke Stabs lowly on the ground. while dashing while dashing while dashing while dashing Dash Slash Slash forwards while sliding forwards a little. Smash + + + (Smash + ) or (Smash + ) or Blade Arch He slashes down in an arch. This move tippered will deal a lot of knockback. Smash + + + (Smash + ) or (Smash + ) or Blade Stab He stabs his sword upwards. The weak point usually knocks opponents into the tip. Smash + + + (Smash + ) or (Smash + ) or Front Back Slash He slashes in front and behind. after grab after grab after grab after grab Knight Knee Marth knees his opponent. after grab after grab after grab after grab Light Push Pushes opponents away. after grab after grab after grab after grab Light Pull Pulls opponents behind him. after grab after grab after grab after grab High Toss Throws opponents upwards. after grab after grab after grab after grab Light Slam Slams the opponent into the ground. Spinning Slash Spins around while slashing. + + + + Front Arch Slashes forwards. + + + + Rear Hook Slashes upwards behind him. + + + + Aerial Arch Slashes above him. + + + + Downwards Arch Slashes downwards. This move has horrible end lag but is a great meteor smash if you manage to hit with the tip. Shield Breaker This is a charging attack that will do above average damage to a shield/the longer b is held, the stronger it gets. Hitting a shield with a full charge will instantly shatter it. When fully-charged in the air, it will give Marth horizontal momentum. + + + + Dancing Blade This can produce up to 18 different slashes, depending on the position of the control stick. + + + + Dolphin Slash Recovery move, Marth jumps upwards, slashing all in his way. His only real recovery move. + + + + Counter Counter-attacks with 110% power the move Marth was hit with. He points his sword straight up. + ( or )+ or or He swipes his sword twice and sheathes it. + He whips his sword around while saying "Minna, miteite kure!" which translates to "Everyone, please look!". . Critical Hit: This move is taken directly from the fights in the Fire Emblem series! If used accurately, Critical Hit is almost guaranteed to cause KOs. You must be aware that using Critical Hit near a ledge or the edge of the screen can be fatal to Marth if you do not manage to hit your opponent, as the move will cause him to rush off the playing field unless you press an the standard attack button again which will cause Marth to slash and stop before running off into his doom.. Critical hit is the most damaging non-countered single hit move in the game, causing 60% damage in a single hit. The window that pops up shows the enemies' hitpoints being drained away (a reference to Fire Emblem). Snake will be deadlier because his standard and special attacks always have high KO Ratings. His side special attack can keep Marth far away, while his grenades can cause a serious nuisance. Pick up his grenades and throw them back, or use to dodge missiles in order to close the distance. Marth's counter can be used to block oncoming missiles and take them out of Snake's control, while leaving Snake temporarily open to abuse. Be wary of his C4 attack and his land mines (if you're not paying close attention, these could be hidden anywhere). If you see a suspect spot, a quick DSmash will safely detonate any mines provided Marth is far enough away. Marth definitely has the advantage here. 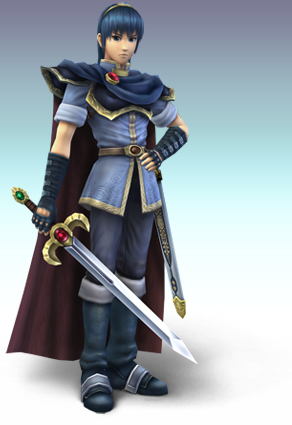 Link's inferior speed and his huge cues when attacking will make a counter-happy Marth-user's day. When the Gale boomerang is returning, with Marth in between it and Link, normally a Link-user will have an attack ready for his opponent as the boomerang closes the distance. Marth can ride the gust back and have a counter ready for what, in most cases, will be a hard-charged strike. Apart from Link's readable play style, his bombs can be caught easily with an aerial dodge. Aside from being slightly faster than Link, and his terrible range and knockback, Marth's strategy for Toon Link is virtually identical (with the notable exception of the Gale Boomerang Counter strategy). Marth can keep Toon Link at tip's distance with impugnity, as it puts Marth outside of Toon Link's range. Any bombs can be caught by aerially dodging them. At close range, Ike is terrifying, even at low damage percentages. Distance is key. On top of Ike's immense power, he also has a range advantage over Marth. That said, Marth can still destroy even the most prodigious of Ike users by employing a hit-and-run strategy with some counters thrown into the mix. Ike is incredibly slow and all of his attacks are easily readable. Build damage with quick, cheap hits, never staying in one area at a time to confuse, or at least frustrate the Ike-user. Once between 40%-80%, a well-timed counter can off Ike in a heartbeat. A cheap strategy, not exclusive to Marth, is Ike's FSpecial when used in recovery. 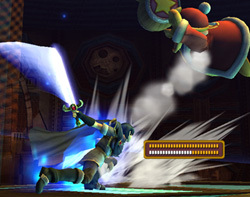 When Ike is charging forward in mid-air and is provoked to swing (triggered by a player skilled enough to jump out from the stage and able to survive a relatively strong hit), Ike can fall helplessly to his death. It is important to remember that the player must incite a hit from Ike, not land one. Meta Knight has a great advantage in speed over Marth. However, Marth's superior range puts him in ideal space for tipped smash attacks. Meta Knight, being a relatively light character, will fly (and not of his own volition) at around 50%-80%. Crippling lack of speed coupled with grandiose gestures before attacking with heavy, heavy knockback thrown into the mix makes a match won against Ganondorf using only counters not only probable, but in the right hands a devastating possibility. C. Falcon is only a faster Ganondorf, with the exception that his power has been nerfed, though his punch, and Knee of justice still pose a deadly threat if not correctly countered. Fox is very well-rounded, with great balance between attack speed and force and can chain combos better than most. That said, a Fox user (or any projectile-equipped character) will begin firing in an attempt to close the distance between himself and Marth. Charge Fox, dodging any oncoming lasers and SHFFL (Short-hop, fast-fall, lag-cancel) forward, until just inside Marth's reach (and conveniently, outside Fox's reach) for a tipped FSmash. Fox's USpecial is easy fodder for an array of Marth's finishing moves; an aerial FSmash while Fox is charging his recover, or a charged FSmash for the moment and spot Fox is expected to arrive, or just counter and call it a day. This page was last edited on 14 May 2014, at 05:47. This page has been accessed 75,158 times.